Ridesharing is the trendy big city cousin of traditional taxi, who is banking big on the use of Technology and threatening to push the old taxis out of the game. 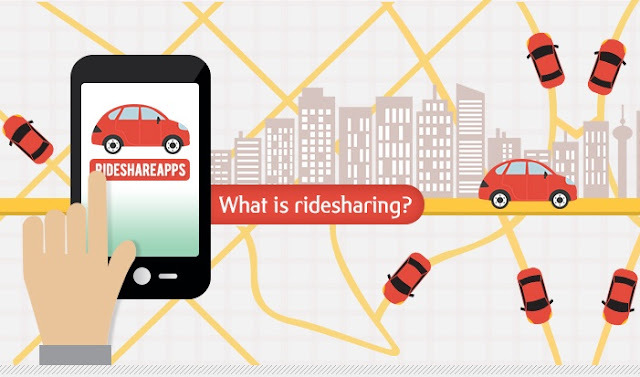 Ridesharing is a fairly new idea, which enables the end users to hail a ride from an app installed in their cellphones, anytime and anywhere! The call for a ride is honored by drivers in the immediate vicinity determined through GPS data sent by the smartphone. Below is the Infographic on Ride Sharing Business Model Success Story developed by rideshareapps. It has only been a couple of years since they started but ridesharing has caught everyone by the storm due to the explosive growth and massive success of companies like Uber, which hasn’t only became a billion dollar unicorn in shortest time but also clung the top position in the billion dollar club. Maturity and outspread of communication technology have put a smartphone in every hand, 2 billion hands to be precise. Today’s Smartphones are equipped with the tools like GPS and 3G/4G that paved the way for on-demand services like Uber that can cater to the customers, a rapid location based service. There isn’t a single taxi company in that operates in all the states of US but, Uber’s reach is in more than 500 cities in 68 Countries around the world. A little understanding of the economy of scales will reveal to us the extraordinary position that Uber enjoys due to its now massive scale of operation. Moreover, it also contributes vastly to its brand value. Many will argue the unopposed growth of ridesharing apps against the traditional taxis as an unfair competition. But, prejudice doesn’t have much intent behind itself; it could be justified more as a process of evolution whereby the convenient and efficient method replaces its older counterparts. Same rule could be applied to the extinction of type-writers, horse-carts and post-mails. So, the convenience offered by ridesharing apps to hail a ride from your home or office and splitting the fare is the jewel piece of its crown. Finally, the success of ridesharing is the talk of the town and many are calling Uber as the Apple of this decade. Now, it could be rightly ascertained that the ridesharing has outgrown the competition and threatening to crush the taxi, if that hasn’t happened already.